You have Catawba at (7-4) +1. They are officially 9-4. I realize you remove the win against Grove City (D3), so 8-4. Why is it listed differently? it wasn't from his grid post. wonder if it is a typo on the w/l record. he had their w/l correct on last weeks KRACH rating. Could be, didn’t notice that. D2 MEN: Catawba beat Queens (N.C.), Le Moyne beat Adelphi, Lynn beat Tampa, Mercyhurst beat Mercy, Rockhurst beat Lindenwood, Saint Leo beat Florida Tech, Merrimack beat Pace, and... Computer Rankings and Game Scores updated. Others receiving votes: Tampa, 25; Saint Leo, 23; Rollins, 18; Maryville, 6; Florida Southern, 4; Chestnut Hill, 3; Saint Anselm, 2. I know we all understand the irrelevance of d2 lacrosse I the college lacrosse community. That watching a lot of these games is comparable to a mid-tier high school team. I realize that goes without saying but I digress. I am all in all disappointed with a lot of teams this season. I expected more from Tampa and the sunshine state conference teams as a whole. I figured the majority of these teams would have breakout seasons and I just as expecting a dominant year for this conference. I mainly figured that Rollins College would be able to make the leap to the next level this season but this has clearly not been the case. Yet, this teams season has been very up and down. They’ve had some big stat padding games that alluded one to believe they might be good. But when facing seemingly competent opponents they have been completely exposed. Barely shooting 20% against ranked opponents and with at least 20 or more turnovers. The coaches are extremely component and seemingly overqualified to coach this group of “Allstars” they have put together. With good, competent coaches in place what has caused them to have such a disappointing season? I believe the players need to step up, they are soft right now for a team with as much upperclassmen leadership as them. When they slide it looks like they are going to hit the other team with their purse, not there bodies. Just clearly athletically and psychically outmatched, the offense has needed to step. And they have not, at all. Barely scratching double digit goals each game. The offense looks slow and boring. Players stopping to look at there stick to see if they caught the ball, Catching the ball on the wrong side of the stick, Players running into each other constantly, stopping in the middle of the play to respond to fan trash talk, one player I believe #3 will line up to play defense on his own players, or sloppy stick skills all around; these aren’t rare occurrences, as they all seemingly happen regularly on there possessions. As I have said I don’t think it’s the coaches fault but is more so on the players. The coaches need to trim the fat and change the culture of this team. Based on the plethora of rumors I’ve heard the coach desperately needs to get his players in check. Nights in jail, substance use issues, behavioral problems, cheating scandals, or there objectification of female students; these are all very consistent with the public and local opinion of this team. I hope that they can turn there season around. I truly do. I want the best for this program and was expecting them to have a breakout year. Yet as disappointing as this season has been the coaches must get there players in check if there’s any chance of salvaging this season, nonetheless the program in its entirety. Good luck and best to all teams competing. I know some hard work has gotten them to where they are today. Well said. There is a lot of good LAX being played in DII these days and those who summarily dismiss it are missing out. As you said DII Mens LAX has grown tremendously in a relatively short period of time. Its fan base has also grown exponentially and DII Mens LAX is deserving of more interest and coverage from the sports community. Sadly, in my opinion, this may require more time than many of feel it should. Come on?! At least top tier high school? Juco?? Lol. Which games are you watching? This is too funny not to quote. With 73 Div II teams... they are bound to run the gamut. So, who is watching which games probably depends on a lot of things. If you're watching Div II lacrosse to see high quality games... then you're watching top ranked teams play other top ranked teams. If you're watching because you've got a player in the race, then you're watching his team play whoever. And if your player is on a weak team, then, unfortunately, you're watching them get killed by ranked teams... and watching 'low quality' lacrosse when they play other weak teams. But, you're cheering 'em on, and want to see them play the best they can, at whatever level they can, right? Which games do I watch? I watch my son's games. I watch the best teams playing each other, and I watch the teams my son's team plays, play other teams, sometimes. If it looks like it will be a decent matchup / close game. 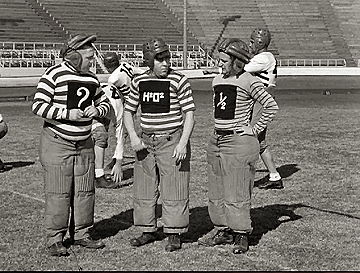 Laxfan69 has made it sound like some Rollins games might have a 3 Stooges flavor to them. And that makes me want to check one out.